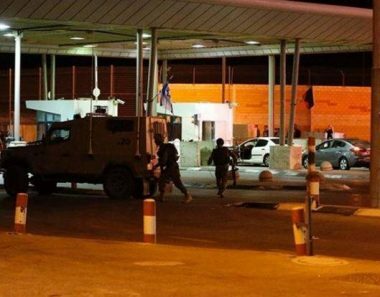 Israeli soldiers abducted, Tuesday, two Palestinians from the northern West Bank governorate of Tulkarem; one was abducted at a roadblock near Qalqilia, and one from his work in Jerusalem. Media sources in Tulkarem said the soldiers abducted a worker, identified as Baha’ Farid Farkh, 22, after stopping him at a roadblock, near Qalqilia, in the northern part of the occupied West Bank. The second Palestinian, Ma’moun Mithqal Shadeed, 29, was abducted from his work in occupied Jerusalem. On Tuesday morning, the soldiers detained two Palestinian photojournalists, working for the WAFA Palestinian news agency, and the Palestinian Broadcasting Corporation (PBC), in Hebron’s Old City of Hebron, in the southern part of the occupied West Bank. The soldiers violently searched the two journalists, Mash-hour al-Wihwah, who works WAFA, and Tha’er Faqqousa, who works for PBC, and broke one of their cameras. One of their cameras was damaged when the soldiers were rough handling their equipment, while searching and interrogating them, and released them later.